You may have noticed that I’ve been a tiny bit absent lately, but I promise it was for a very good reason. 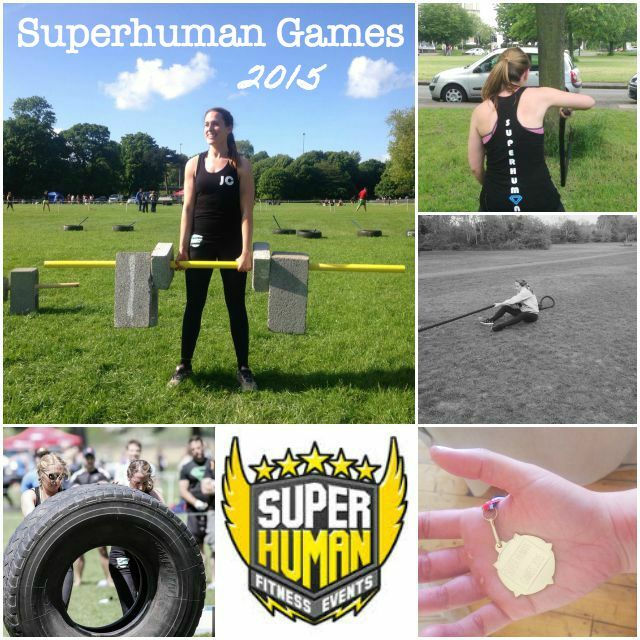 In November last year, I bit the bullet and agreed to take part in the Superhuman Games. The Superhuman games are designed for strong, athletic and competitive people to get together and have a massive fitness competition whilst strutting around feeling like tough guys (and girls). And if you know me, you’d know I am neither strong, athletic nor competitive so this is not my natural environment. Let 8 months of nerves commence. The thought of spending a day competing with actual Superhuman type people scared me enough into doing some decent training during that time, which was good for my fitness but bad for having the time to devote to blogging. Training for the Superhuman Games was a total (terrifying) fitness challenge, which involved weight lifting, cardio and endurance training. It was a full day event, made up of five 20 minute events across the day which you compete in pairs…lucky for me I was competing with one of those Superhuman people who patiently got me through it. If you need any personal training in Bristol, I highly recommend Jenny’s Fitness, that woman is a motivational powerhouse. First up was VO2 Max. 10 minutes rowing 300m as fast as you can whilst your partner sprints a 150m shuttle run, then you swap for another 10 minutes. Our first event for the day and the one that gave me an inkling that I might have got myself into a bit of pickle. This is an almost literal illustration of what happened when I walked away from that rower. …5 minutes of carrying two 25kg buckets up and down the field, alternating with dragging a 15kg plate up and down a field. Ouch. The last event before lunch was Brutal Beat Down, which involved flipping a 150kg tyre 5 times with your partner then 10 chest to floor burpees jumping over a box in between. Holy moly, this may have been the longest 20 minutes of my life. I mostly lay on the floor after this and tried to stop my body going in to panic. Strength and Honour involved 5 reps of 65kg deadlifts alternating with hitting a tyre up and down a field with a sledge hammer. This one was an almost complete disaster because I could not, for love nor money, get that 65kg of concrete off the ground until I twigged that in fact my gloves rendered me unable to do a deadlift and I was back in the game as soon as I took them off. I survived! And by the end of the day, there is only one woman who can express how I felt. Yes Liz Lemon, months of training and lot of deadlift related fear all over! As much as I spent the day in a nervous daze, when I look back on it I really did enjoy it. It improved my strength, fitness and confidence in the gym and I got myself a medal (totally worth it for a medal).